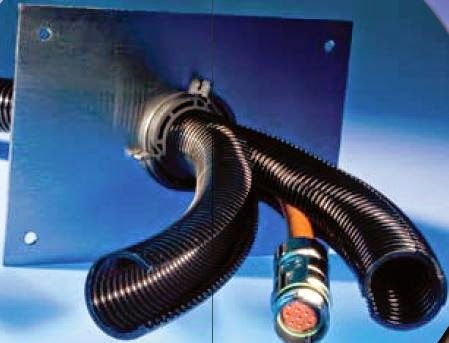 Murrplastiks new EWT-Split-Flex cable protection conduit - Two part, slit and re-sealable version. The two part EWT Split Flex cable protection conduit and the accompanying AT click connector system can be used with all parts from the MP program. Both systems allow pre-assembled cables and turnkey cable sets to be mounted into machines, equipment, control cabinets and walls with only a few steps. It takes only a few tool-free steps to install the new AT split connector from Murrplastik Systemtechnik - one click and it's done. No complicated installation work: the protective conduit is fed into the cabinet, with the first half of the fastener set on the inside and then pushed through to the outside. The matching piece is clicked on from the outside. DONE! The technical concept is simple but efficient. The AT split connector consists of two halves and can be guided along the hose and then clicked into one another.